Last month, Daniel Pipes made the case for Western support for the Assad regime in Syria. He based this on the idea of sustaining a stalemate between the tyrannical regime of Bashar Assad on the one hand and the Islamist insurgency forces on the other -- neither of whom are paragons of Western democratic values. Evil forces pose less danger to us when they make war on each other. This (1) keeps them focused locally and it (2) prevents either one from emerging victorious (and thereby posing a yet-greater danger). Western powers should guide enemies to stalemate by helping whichever side is losing, so as to prolong their conflict. His examples of past implementations of such a strategy are the Nazi invasion of Russia and the Iraq-Iran war. Now there appears to be an additional aspect to maintaining the stalemate in Syria. quagmire. How do you say quicksand in Arabic? According to an organization monitoring the conflict, some 141 Hezbollah fighters were killed in the last month alone, 79 of them in the last 10 days, during the battle for the strategic stronghold of Qusayr, near the Lebanese border. In other words: Hezbollah lost more than one percent of its operational combat power within a month due to its support of Assad - quite a significant number of casualties for a relatively small guerrilla movement. 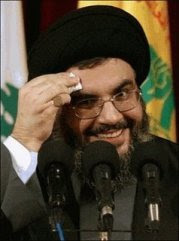 Nasrallah is facing unprecedented inner criticism in Lebanon due to his intervention in Syria. This week Britain and France promoted an initiative to have the European Union declare Hezbollah a terrorist organization - a move that could profit Israel, since it might limit Hezbollah's operations abroad. Muslim history is filled with battles among Muslim forces from the early beginnings of Islam, so the fighting among Muslim armies is not surprising. In this case though, it may be coming at an opportune time for the West as the Arab Spring reveals itself as a resurgence of dangerous Islamist extremism. Similarly, Israel finds that Hezbollah -- Iran's key terrorist tool -- is not only increasingly occupied in Syria, but finding itself weakened in the process. Daniel Pipes may well be onto something. Technorati Tag: Israel and Syria and Hezbollah.